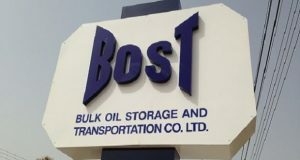 The Bulk Oil Storage and Transportation Company Limited (BOST) with effect from January 1, 2016 pays $3.6 million annually to TSL Logistics Ghana Limited, a subsidiary of a Nigerian Company as operations, maintenance and management fees, in a deal that was rocked with controversy when it was signed. This translates into a monthly payment of $300,000 for outsourcing the management of its petroleum storage facilities within the Accra Plains Depot to TSL. TSL’s monthly charge was reduced from $660,000 to $300,000 a year exclusive of utilities charges, taxes and this was achieved through negotiations, according to BOST. This means, TSL received $7.9million ($7,920,000) annually prior to the reduction. TSL to pay for 5m litres contaminated? In light of the contamination of 5million litres of products at the Accra Plains Depot, it has been suggested that if it is established that the wrong valves may have been opened to displace the pipeline cargo, TSL as managers of the depot, must be held responsible. On the other hand, industry players say if it is determined that Kpone Marine Services (KMS) may have wrongly indicated the type of product in the pipeline, it must be held fully liable and not BOST. KMS/ TSL have responsibility for the management of the depot and they determine and designate appropriate tanks to receive each cargo. They also authorise actions and inactions in the depot. In the view of industry watchers, it is, therefore, expected that in the occurrence of this type of contamination, either TSL or KMS would have been held accountable if liable. They, therefore, described as scandalous news that BOST/Government will want to bear the liabilities relating to this contamination instead of holding TSL or KMS responsible. Tongues are wagging about the amount being paid TSL because BOST is responsible for paying salaries of staff at the tank farms. BOST said TSL Ghana’s operations continued to focus on improving the technical competencies of BOST’s depot staff. According to BOST, the TSL Group provides world-class comprehensive product handling services at BOST’s tank farms, such as General Operation and maintenance work as well as inventory management and product dispatch. The management account noted that the gains from this effort are already visible as operating revenues have increased significantly and product losses are non-existent. Furthermore, it stated that due to the significant improvement in storage and rack revenues and prudent expenditure in managing, Terminal Operations earned a net profit of GH₵8.1million (GH₵8,126,343) after set-off of product loss replacement arrangement of GH₵3.8million (GH₵3,865,535). It will be recalled that the deal was opposed by some groups and individuals who have knowledge about the industry. Initially, BOST workers opposed the deal but later changed their position and offered support to management to go ahead. At the time, Chamber of Bulk Oil Distributors (CBOD) kicked against the arrangement alleging that TSL Logistics is not even licensed to carry out the services outlined in the deal. According to the Chamber, the local industry has better capacity to execute the deal to the country’s economic advantage and so the deal if allowed to stand would defeat the then President’s campaign to empower local businesses by promoting the consumption of local goods and services. At the time, Chief Executive Officer of (CBOD), Senyo Hosi, said “when it comes to managing terminals, our people have invested $180 million in infrastructure, competency and skills for a number of years now. So if you want to outsource the management of your terminals, I think it is only fair that the indigenous capacity is even given a biased chance. But even if not that, give at least a fair chance where everybody can come in and bid but you rather do sole sourcing and go for TSL, a Nigerian company. “And the disappointing thing is that you just don’t go for somebody who is bigger or more competent than us that we will even think that there is possibly something more strategic that they may deliver that we can’t. But you go for somebody whose management experience does not exceed any single one who offers the same thing in Ghana. So what is the motivation?” he quizzed. When news of the deal broke in 2014, Dr. Charles Wereko-Brobbey questioned whether due diligence was done before the contract was approved. “Government is now saying that sole-sourced procurement must be approved by cabinet, so are we to assume that President Mahama and his cabinet approved this without doing any due diligence, without establishing that there are competent local companies that can do this. “I have information that this company is not registered, am not sure, but it needs to be verified. A company that has got no experience in the industry and is not recognised by the regulatory authority in this country, that is the NPA, is being sole-sourced to manage a tank farm that contains our national strategic and security stocks, that begs a lot of questions and I think we need a better explanation from BOST”. He adds that, “If, indeed, this company is not registered with the NPA, then this deal must be stopped immediately, even if it means going to court, it must be stopped; we cannot have people operating with impunity against the laws of this country, it’s not possible,” he said.